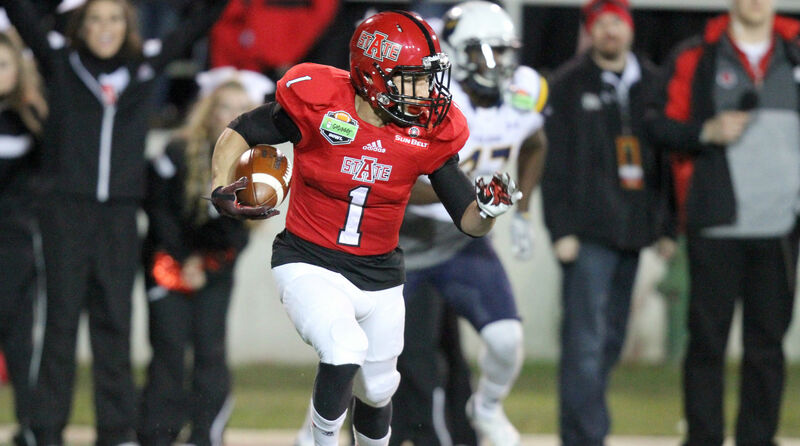 Arkansas State defensive back Blaise Taylor is way, way ahead of schedule for an FBS football player, and he's showing no signs of slowing down. Blaise Taylor is the fastest man in the Football Bowl Subdivision. In fact, he might be the fastest ever. Record-keepers have been searching around this month and haven’t found anyone faster. But in this case the speed of Arkansas State’s standout defensive back/kick returner isn’t measured by a 40 time or something he did with his school’s track team. It’s more meaningful than that. The most challenging aspect was avoiding distractions along the way. “For most college students, it’s the first time in their life where you have minimal structure and a lot of free time to spend how you want,” Taylor says. Taylor’s mother, Dr. Evelyn Taylor, earned her Ph.D. in psychology; his father is Red Wolves cornerbacks coach Trooper Taylor. Blaise credits his family, academic coordinators, coaches and athletic director Terry Mohajir for helping him accomplish a goal he set while he was still in high school. Taylor had a unique perspective on college athletics, growing up as his dad rose up in the coaching world. Trooper Taylor was a terrific kick returner at Baylor and has coached at Auburn and Tennessee, among other stops. At 5' 9" and 165 pounds, Blaise is a record-setting return man in his own right, with three career punt returns for touchdowns. He also ranked third in the Sun Belt in passes defensed last year, with 12. As an undergrad, Taylor took six courses per semester: He normally had three hours of classes on Monday, Wednesday and Friday mornings, and then two classes on Tuesday and Thursdays, plus one online course. In the afternoon, he would go straight from lunch to football practice to dinner with the team, and then back to his room to do homework, turning the TV on if the Cowboys were playing in primetime. In addition to his work on the field and in the classroom, Taylor is up for consideration on the Allstate AFCA Good Works Team for his off-field contributions in the local community. He is involved with the Fellowship of Christian Athletes; serves as a liaison between the football players and the athletic director on the Student Athletic Academic Council (SAAC) and advocates for changes to improve the environment for the student-athletes on campus. Last year he organized and coordinated student-athletes’ efforts to sponsor a child at Christmas by collecting monetary donations and purchasing gifts on the children’s Christmas lists. He has done community service work at several other organizations, but his interest in working with at-risk youth drew him to a local alternative school called Success Academy, where he volunteered twice a week last year. That experience motivated him to create his own non-profit, The Power of One and Two, designed to work with underprivileged children. He and his sister Starr (who wears No. 2 for the Arkansas State women’s basketball team) just completed the process to have the non-profit incorporated. After finishing his playing career, he plans on becoming a sports agent and starting his own agency.